Small Cross Keepsake Urn is available in Sterling Silver (top photo) or Gold Vermeil (lower photo). Vermeil pendants are plated with 100 milligrams of gold, the best grade of plating. The cross measures in at 13/16" tall x 1/2" wide. Please limit engraving to no more than 4 characters on the front and 4 characters on the back. A small funnel, filling instructions, care card, and gift box are included. 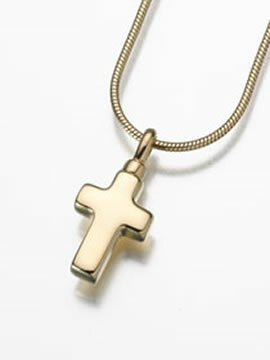 A free black satin cord is included or you may purchase a Sterling Silver or Gold Vermeil chain for an additional fee.